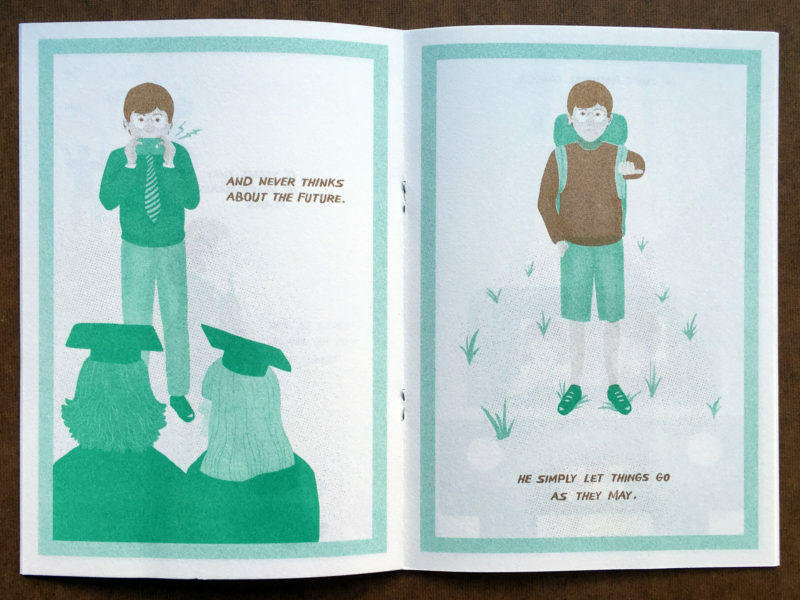 Ping Pong #03 is all about the printed, physical object, and the results are stunning. 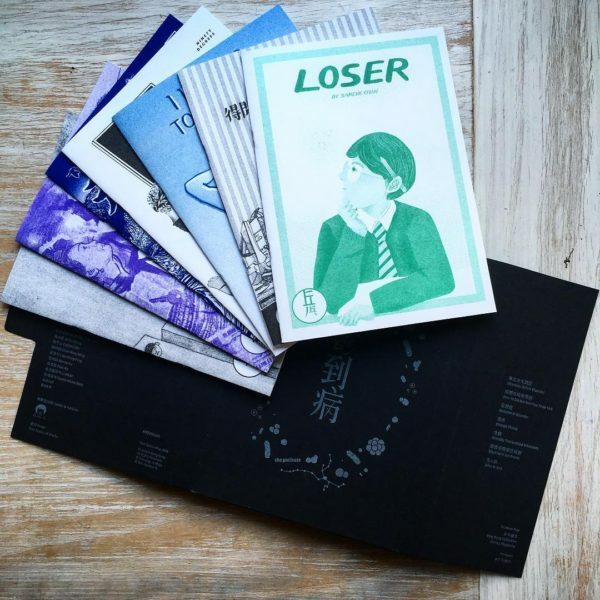 Eschewing the convention of a single, bound book, Ping Pong #03 comes as a lushly-packaged set of seven booklets, written and illustrated by seven different artists. While every booklet looks visually distinct, they all bear the mark of the risograph printing process: bright, dynamic, full-bodied colors (including some neons and metallics), and a limited palette of 2-3 colors per work. The attention to detail is laudable. As such, the package as a whole is not only a comics anthology, but a beautiful printed artifact. As with its previous issues, the stories in Ping Pong #03 range from the mundane to the bizarre. What sets this issue apart is an almost universally-shared sense of absurdist, dark humor. In Loser, Sarene Chan toys with the stereotype of a “good boy,” a model student. In 11 Ways To Deal With Anxiety, Uuendy Lau riffs on the cult of self help by documenting strange animal behaviors. In 阿卿正傅, Leumas To takes his political lampooning to new heights by mashing up local, political figures with scenes from Wong Kar Wai movies. While the visual storytelling overall in Ping Pong #03 is stronger than before, the collection continues to lean towards the picture book tradition (one panel per page) rather that of comic books (multiple panels per page). An unfortunate side effect of this style is that the stories tend to be short, and are often abstract or discursive rather than narrative. Ping Pong is currently the only active comics anthology in Hong Kong, an unusual position for such an experimental publication. Joint Publishing, a long-time supporter and publisher of locally-produced comics, last released an anthology in 2013. Luckily for us, Ping Pong #03 is the collective’s best issue yet, and it’s fast becoming a serial publication with a strong, unique voice of its own. Purchase Ping Ping #03 from select retail outlets in Hong Kong. Read our review of Ping Pong #01-02 here.